Of all the impacts that caused extinctions of Columbia River Basin salmon and steelhead, dams were the most significant. And the most significant of the dams, at least in terms of the number of known runs that were extinguished, is Grand Coulee. The dam wiped out runs that spawned in tributaries that drained into the Columbia from that point, river mile 596, to the headwaters, a distance of 645 river miles. Adding the tributary miles where salmon spawned nearly doubled the distance. The Bureau of Reclamation, which built the dam, was aware of the impact Grand Coulee would have on salmon and steelhead and took steps to compensate for the losses through the construction of hatcheries. This was complicated, however, by the fact that the upper Columbia salmon runs had been declining for years before the dam finished them off. The Bureau contracted with the Washington Department of Fisheries to assess the runs and recommend a means of preserving them. The resulting 1938 report, issued by B.M. Brennan, director of the Department, detailed the decline of Columbia River salmon from multiple causes. The report contained recommendations for preserving and relocating the salmon and steelhead runs — the North Central Washington Upper Columbia River Salmon Conservation Project. The cost was estimated at $2.6 million, which would be paid from the Grand Coulee construction fund. The plan called for trapping adult fish at Rock Island Dam and transporting them in tank trucks to release points in rivers and streams below Grand Coulee and also, eventually, to a hatchery that would be built at Leavenworth, on a Wenatchee River tributary called Icicle Creek. From there, juvenile fish eventually would be transported to release sites throughout north central Washington. “The fishery of the Columbia River has been decreasing slowly since the turn of the century. The constant inroads of civilization have continually worked to the detriment of fish populations. First irrigation diversions, then small hydroelectric dams on several tributaries, then more and larger irrigation diversions, over-fishing by the commercial interests, increasing sport fishing, gaffing of fish on the spawning grounds, and increasing industrial and domestic pollution bringing pressure constantly against the fish populations have slowly decreased their former abundance. So many factors were at work in so many ways, that the public’s attention was never riveted for any length of time on the decreasing value of this enormous natural asset. “. . . In the first burst of enthusiasm that the whole Northwest felt at the culmination of its plans, the fact that the construction of this dam would strike a serious blow to the Columbia River fishery was overlooked by the general public. When the plans for the high dam finally were approved, it became apparent that salmon could not be put over a dam of this height as they had been at the much lower Rock Island and Bonneville dams. The stock of salmon spawning in some 1,100 miles of river and tributaries was to be permanently destroyed. Further study revealed that the alternative methods for preserving these runs would be extremely expensive, if they were possible. There was a feeling that the vast economic gains to be derived from this project should not be endangered by consideration of the fish. It was even felt in some quarters that the fish were not worth the money that it would take to preserve them. 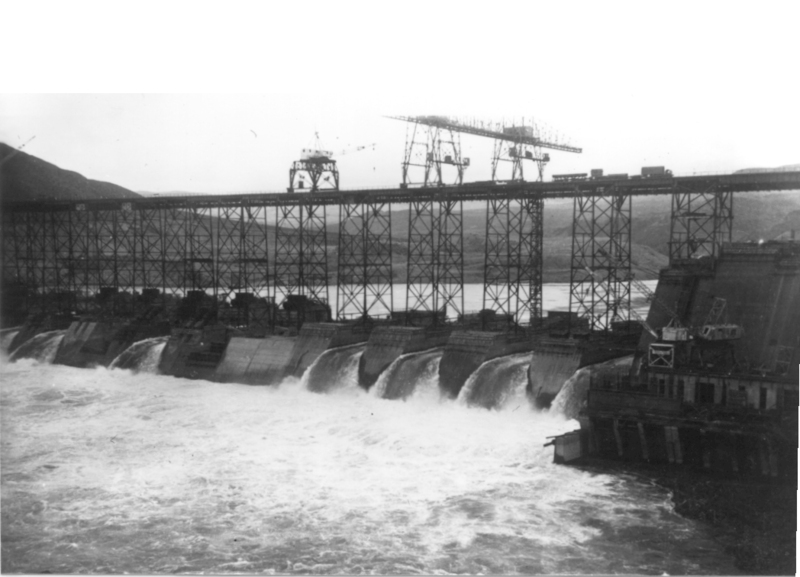 According to Brennan’s report, “the pressure of public opinion” forced the construction of fish protective devices 400 miles downriver at Bonneville Dam. The pressure of public opinion also may have played a part in the decision of the Bureau of Reclamation, then called the Reclamation Service, to preserve some remnant of the salmon and steelhead that its dam at Grand Coulee would wipe out. Making the decision was the easy part; making it happen was the hard part. As Brennan notes in his report for the Reclamation Service, “there was left the question of what was the best way to take care of the fish.” Little was known, he wrote, and he might have added that there was little time. 1938 was the year construction at Grand Coulee Dam finally would cut off the river to migrating fish. An investigation was needed — of fish behavior, migratory patterns, abundance, spawning locations, tributary water flow and temperature. So many things. Because the state couldn’t afford such a study, the Reclamation Service gave the state $25,000 for a one-year investigation. The state didn’t receive the money until the spring migration of juvenile salmon nearly was over. Only six months of field study was possible. Brennan did the best he could. Brennan cited five reasons why fish passage at Grand Coulee would not work. First, water immediately below the dam could be expected to fluctuate as much as 40 vertical feet within periods of minutes, depending on power production. It would be difficult, at least, to build a fish ladder that would operate efficiently in such conditions, he reasoned. Second, because the dam likely would be spilling water in the summer when the fish arrive on their upstream journey to spawn, the fish, which are attracted to agitated water, likely could not find the ladder entrance. Third, in the spring and early summer, when the juvenile fish are heading to the ocean, the giant irrigation pumps would be sucking up to 18,000 cubic feet per second from a spot directly behind the dam, an amount of water Brennan likened to the flow of the Skagit River in western Washington. “It will be a practical impossibility to screen these pump intakes with mesh fine enough to keep the young fish out,” he wrote. “Large numbers [of young salmon and steelhead] would be pumped into the irrigation system to perish.” Fourth, water would not spill over the dam all year round, and so at certain times of the year — the fall, for example — young fish would be stuck behind the dam, where there likely would not be enough food for their survival through the winter. In the spring, when the river is higher, young fish swept over the dam would face a “. . .400-foot slide down the concrete face of the dam,” and “...all or mostly all would be killed.” Fifth, even if the fish could be carried over the dam in a column of water and not touch the concrete, where they would be battered and descaled, “. . .it is questionable how safely they could negotiate this 350-foot fall.” That’s an understatement. His solution was to hold the salmon, somehow, until they were ready to spawn and then transfer them to Columbia tributaries downstream of the dam — the Wenatchee, Entiat, Methow and Okanagon. But what about the salmon and steelhead that spawn in those rivers? Would they be held, too? It would be impossible to tell them apart, and so all must be collected together. But where would they be taken? And when? Each population would have a unique run timing. Imagine each population as an alarm clock set to go off at a different time. There was no acceptable water supply near Rock Island Dam for rearing ponds, but there was sufficient clean water and a good location at Icicle Creek, a Wenatchee River tributary near the town of Leavenworth, 42 miles from the dam by highway. Brennan’s plan was to collect adult salmon and steelhead at Rock Island Dam and haul them by truck to release sites on the Wenatchee, Okanogan, Methow and Entiat rivers. Ultimately, the Leavenworth hatchery would produce fish to supplement the runs in these rivers. Brennan knew it would be impossible to naturally produce as many fish in the 677 miles of those four tributaries below Grand Coulee as in the 1,100 miles of tributaries above the dam where most of the captured fish would have spawned. So hatchery production would supplement natural production. “Instead of a natural crop of young fish from these four tributaries, it becomes necessary to produce an intensified crop far in excess of that which could be produced naturally,” he wrote. And these fish would be different from other hatchery fish. They would be bigger — closer to the size they would have been had they been hatched above Grand Coulee and migrated to the sea naturally. “Such a program may offset the damage done by Grand Coulee Dam; ordinary hatching and liberation in the young fry stage cannot,” he wrote. These were not pristine rivers. In fact, they suffered some of the same problems as modern-day rivers. For example, the Okanogan River was “a sluggish, slow-moving stream” whose chief salmon-producing tributary, Salmon Creek, was so heavily pumped for irrigation “that it’s rehabilitation for salmon reproduction is impossible,” Brennan wrote. The Methow supported salmon, but the small size of the run likely was due to the impact of a hydropower dam constructed at its mouth in 1915 and removed in 1929, and the fact that the river “has a particularly large number of irrigation diversions.” The Entiat, in contrast, was an excellent salmon river — with few salmon. Like the Methow, the Entiat once had a power dam near its mouth, which later was removed. The dam blocked salmon, and the damage was done. The Wenatchee River’s salmon runs suffered from large irrigation and power diversions. Each of the rivers had unscreened diversions that were lethal to juvenile fish. It wasn’t ideal, but it was all they had to work with. The trapping and hauling began in May 1939. Fish were trapped at Rock Island Dam, transferred to a tank truck and then transported to releases sites — two in the Wenatchee drainage (Icicle Creek and a spot on the main river called Monitor) and one each on the Methow, Entiat and Okanogan rivers. In the process, the biologists learned a good deal about salmon. For instance, they learned that even though water temperature in the unrefrigerated tank truck rose steadily, there seemed to be little effect on the fish. In the three-hour hauls to Oroville, on the Okanogan, and Twisp, on the Methow, the water temperature would rise by as much as 16.2 degrees. One time, the water temperature on arrival at Oroville was 79.7 degrees, about 12 degrees above lethal for salmon. But, according to the report, “these fish were certainly as lively and appeared, outwardly, at least, as healthy as any fish hauled.” There was concern, however, for the viability of the eggs and sperm following such a temperature shock. The biologists also learned about the importance of properly oxygenated water during transport. During one haul to Icicle Creek, the oxygen pump broke down during and 29 out of 30 salmon were dead on arrival. In general, though, the biologists were impressed with the resiliency of the fish. Upon releasing fish from the tank truck, many were noted with scars, gouges and other wounds, but these fish would revive in the water and swim off apparently unaffected. They were hearty fish — they are hearty fish today — but in 1938 they faced a gauntlet strikingly familiar to the one modern salmon face. There were dozens of gravity diversions for irrigation on each river — 73 total on the four rivers, not including the complete diversion of Salmon Creek, plus diversions on the Okanagan in British Columbia above Lake Osoyoos. Also, there were numerous irrigation pump stations that lacked fish screens. All told, the gravity diversions alone accounted for all but roughly 100 cubic feet per second of the combined average flow of all four rivers. As happens today, rivers can be overappropriated, and when flows are below average, the rivers can run dry. There were diversions for hydropower dams, too — three on the Wenatchee River alone. In March 1940, the trapping and hauling began for the second year. Some of the fish were taken to the Leavenworth hatchery, now completed. On August 6, 1941, the first salmon reared at the hatchery, 50,000 fingerling Chinook, were trucked to the Entiat River and released. Later, other hatchery progeny were released into the Methow, Okanagon and Wenatchee rivers, and by 1942 the adult progeny of fish that had been trapped and transported up to three years earlier began returning to spawn. The Bureau of Reclamation claimed victory in 1943 — the same year no salmon or steelhead showed up at the base of Grand Coulee Dam attempting to continue upriver — and sought to turn over the Leavenworth hatchery and its related facilities to the U.S. Fish and Wildlife Service. By 1949, ownership had been transferred to the U.S. Fish and Wildlife Service. While it is true that salmon were returning to spawn, they were not returning in numbers even close to pre-dam counts and, of course, none of these fish was destined to spawn above Grand Coulee. In 1933, the year construction began at Grand Coulee, 51,879 salmon swam through the fish ladders at Rock Island Dam. Through 1942, the highest count was 35,000, and most years were far lower. Paul Pitzer, in his history of the dam, Grand Coulee: Harnessing a Dream, concludes it simply isn’t known whether the salmon transplant experiment was a success. Other impacts damaged the salmon runs, including the construction of new dams downstream, construction of irrigation systems on tributaries, diseases at the hatcheries, overfishing and pollution. “In the 1930s, when the dams were the highest priority, the salmon survived more through good luck than government efforts,” he wrote. Meanwhile, north of the border Canada appears to have been truly indifferent to the loss of salmon and steelhead from Grand Coulee. It is true that a few citizens spoke against the destruction of the Canadian Columbia River runs at the public hearings conducted by the International Joint Commission at Trail, B.C., and Spokane in 1941. But neither British Columbia nor Canadian federal fishery agencies registered concerns at the hearings, and the citizens who spoke seemed more interested in ensuring that the Americans who killed the runs would provide replacement fish in compensation. In fact, the state of Washington eventually built two hatcheries to release fish — trout and kokanee — into Lake Roosevelt as partial compensation for the loss of salmon and steelhead. Canadian federal officials were not entirely silent on the matter, however. In October 1934, as the initial site preparations were underway at Grand Coulee, the Canadian Legation in Washington, D.C., took note of the fact that the high dam — with no fish passage facilities — meant ruin for Canadian Columbia River salmon. The Legation expressed its concern in a letter to the federal Ministry of Fisheries in Ottawa. Remarkably, the Canadian government wrote off Columbia River salmon because there would be no adverse economic impact from their loss. In 1936, three years after construction began, the Columbia River still was flowing over the foundation of Grand Coulee Dam. By 1938, the rising dam would block the river. Photo: Spokane Public Library.